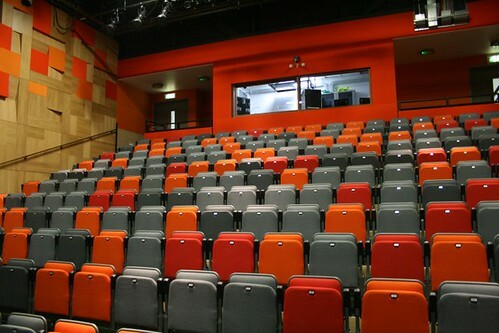 Didcot’s new arts centre, Cornerstone, has finally opened. Over the weekend of 30/31 August, the centre opened its doors to allow the public to have a look around the new building. The centre includes an auditorium, an art gallery, a dance studio, an arts studio and two other multi-purpose rooms. Many of the rooms have large windows overlooking Station Road and the town’s new square, which is to be named Brunel Square after the founder of the Great Western Railway (which ultimately is what caused Didcot to develop into the town that it is). The finishing touches are still being made to the landscaping surrounding the centre, so I concentrated on photographing the interior. Photos can be seen in my Didcot gallery.